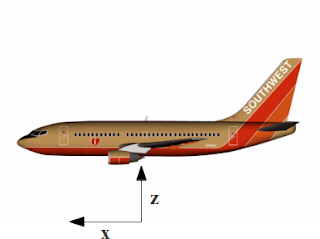 Hypothetically, if one were to be on an airplane in possession of a smartphone with the right app, one could hypothetically gather acceleration data of the planes motion. I (hypothetically) was on a plane earlier this summer and (hypothetically) had my phone in airplane mode running the data gathering program with the display off until the plane landed and reached the gate. My phone has a 3-axis accelerometer built into it. 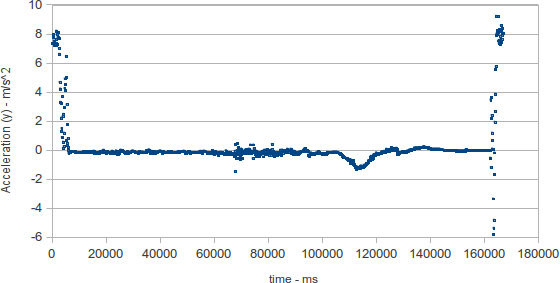 The figures below show the orientation of my (hypothetical) data gathering. I figure that I should (hypothetically) let the data gather for 5 minutes and hope that the landing happens in that time. After starting the data logging app, I turned off the screen and set the phone on the floor by my feet. 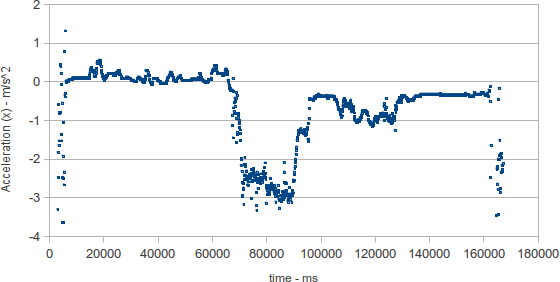 In the z-direction, you can see the setting down and picking up of the phone at the start and end of the graph. (Note the full 5 minutes was not used.) 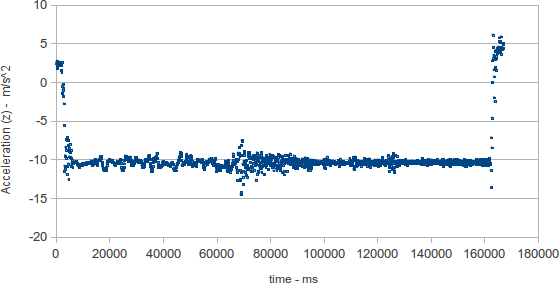 The acceleration is fairly constant around -10 m/s^2, due to the gravitational field. What was interesting to me was that the average value before the (hypothetical) touchdown was the same as after touchdown, although definitely not as smooth. In the y-direction you can again see setting down and picking up the phone, as well as the (hypothetical) landing event. 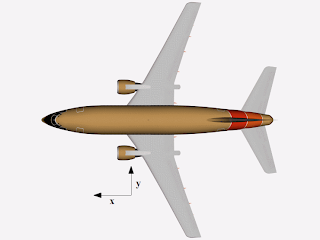 There is an acceleration in this direction as the plane turns to head towards the gate. But what we really care about is whether or not this plane is going to stop moving at a high speed in the forward (x) direction. The acceleration data here is interesting! The maximum acceleration is about -3 m/s^2. There are several braking events which happen. Does constant acceleration apply here? Over certain intervals the acceleration is approximately constant, but not over other intervals. Now I know what the acceleration of a plane landing is (hypothetically) like. Want the raw data? Here you go. Hypothetically, I would like to know what the acceleration of a plane is like on take-off, but I don't have another (hypothetical) plane trip scheduled for awhile. Always follow the instructions of your flight crew. You don't want to pick that fight. You will lose.